The Magnum Panther 8.0 is a comfortable, lightweight boot without the side zip. The Hi-Tec Magnum Panther 8.0 with it's sleek style is great boot giving good grip with the slip resistant sole unit. The Panther has a metal shank in the sole for betters stability and grip. 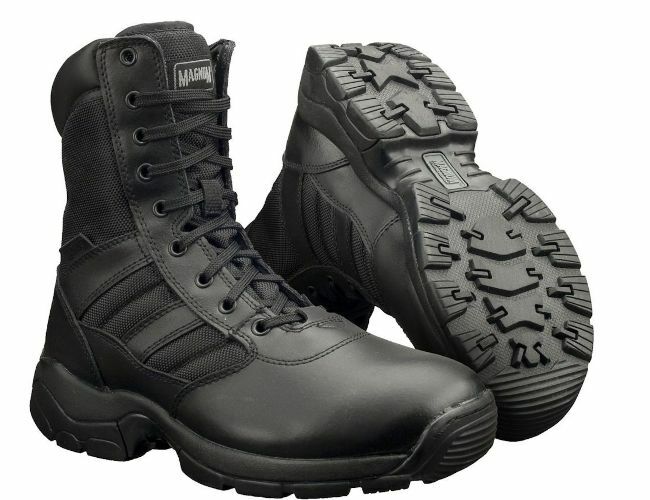 This boot is a great price and loved by the Police and cadet units.This boot has Magna barrier leather with 900D nylon upper that is abrasion resistant.The removable insole is built to last, and has a padded collar that makes this boot very comfortable.This is a good boot for people wanting a tough, comfortable boot that will not break the bank..
Certified to European standard with SRA slip resistance. Fast wicking comfort lining ensuring your foot is kept dry and comfortable. CEN sole unit accredited to the BS EN 347 standard ensuring the ultimate in quality. Uniquely manufactured 'CE' approved carboxilated nitrile rubber sole, offering increased rubber thickness and in-built EVA for lightweight comfort. Removable EVA sports footbed for added comfort and increased suspension.